Many of the larger genealogy web sites now allow people who are researching their family trees to load these onto the World Wide Web and it is also possible for individuals to set up their own web sites. In addition large numbers of CDs have been issued which contain collections of family trees. There are also many printed histories. There are so many such family trees and histories that there is no way that I could possibly provide an index or detailed finders guide, of to provide a service where you could record your family tree or history on this web site. It is important to realise that information from family trees can be of very variable quality, and it is often hard to tell whether you can trust it or not. Some family trees may be based on the records of someone who was born 200 years ago who recorded invaluable information about people who he personally knew while others may have been drawn up online a few weeks ago by a rank beginner who was too lazy to read "Genealogy for Dummies" and who never checked online index entries against images of the original records. You should also be aware that there are people who set out to collect as many names as possible by copying other people's trees (errors and all) without any checking. The last of these is a case study discussing how errors got into my own family tree, which I started drafting over 30 years ago. There is an important lesson to be learnt. Before you use any family tree, online, on CD, or on paper, you should assess the quality of the work by checking key events against selected original records for accuracy. When this site started I created this page to record good examples of web sites which described Hertfordshire families and the towns or villages where they lived. I soon discovered that to provide such a service would take too much time and energy but the following links were set up in 2001 and still appear to be valid. In addition to containing information on the families he is researching Shaun's site also includes some photographs and background information on the villages of Bovingdon, Flaunden & Chipperfield, including a full transcript of the 1841 census for Flaunden. My BODDY/BODY family were Millers in Buntingford for over 300 years where they owned and worked the Aspenden Watermill and a Windmill in Layston and a Windmill near the Watermill. The first mention of my BODDY family in Hertfordshire is in 1520 in Barkway, Hertfordshire and we have proof of a connection to this family with our first Master Miller at the newly built Watermill in 1670 as members of the Barkway family were witnesses to a will of John BODY son of our first William BODY who died of the plague in 1679. This has been a very colourful family to research and this website is still under construction. Further items to be added will cover BODY family members from Somerset involved in the Bloody Assizes, BODY family member emigrated from Essex to Virginia in 1650 acting as agent to ship settlers to the New World. The Knights Templars who owned the land at Aspenden in the 13th Century. Philip Sherwood (phil.sherwood @t one-name.org) has submitted his website at www.sherwoodfam.plus.com for inclusion in family histories. It includes trees of my CARTER & KIDDLE families around Stevenage & Hitchin, with family photos & maps. He says I was actually born & raised in Cheshunt, but my Sherwoods came from Kent. Starting with William De La Ffelde who moved to Buckinghamshire in the 14th century members of the Delderfield family lived and worked in and around the Tring area for many centuries. This site tracks the Skipp line back for about three centuries through Kings Langley, Hatfield, Rushden, Cottered, Ardeley, Royston, Sandon and Little Hormead. In also includes information on the Sheppard family in Hertfordshire. This has the makings of a very good site and while, at the time of writing, it is not clear where David Thrale fits into the family tree, there are some useful texts about the Thrales online. In particular the site holds the text of the 1952 edition of Historic Sandridge by Giles & Thrale. David Thrale (webmaster @t thrale.com)has now written: Do you remember that you said "it is not clear where David Thrale fits into the family tree". 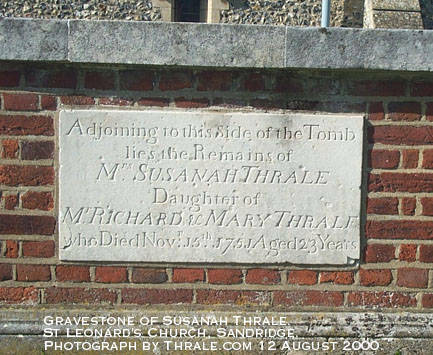 Well the good news is that I have worked it out - I'm the 16th great grandson of Robert Thrale of Sandridge (died 1538) and I'm one of the Thrale's that ended up in Wheathampstead. My site now holds the most comprehensive Thrale family tree (which now includes me) on the Internet with 800 people of which 200 were born Thrale. It is available in GEDCOM, web and PDF format at www.thrale.com. Rob Sherwood (rjsherwood @t optusnet.com.au) has traced his family back to a baptism at Clothall, Herts, in 1744, his ancestors moved to Weston, Herts, before moving to Fowlmere, Cambs, by 1810, and later still emigrating to Australia. Even if you are not related, the site is well worth a visit to see the wide range of documents consulted to fill in details of his ancestors' lives. It also includes some interesting information about the places where they lived. Judith reports that she has gone another generation back to William's parents, another William (1710 - 1781) and Elizabeth. However, I'm still hunting for the marriages of both William and Elizabeths. 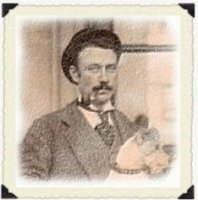 "My Holinshead family, who were farmers in Hertfordshire, have been traced back to my 4x great grandparents, William Holinshead and his wife Elizabeth. They lived at Kettlewells Farm, St Albans, Hertfordshire. My 3x great grandparents were Thomas Holinshead and his wife Jane. They also lived at Kettlewells Farm." Judith White.